Dr. Sotela is a native of Potomac, Maryland. She grew up riding and showing hunters and jumpers, as well as playing polo. As a young woman, she also spent several years working as a veterinary assistant on the East Coast show circuit. These experiences allowed her to gain a strong background in lameness diagnosis and sports medicine, furthering her enthusiasm to become an equine veterinarian. After earning her BS in Animal Science at the University of Maryland College Park, Dr. Sotela attended veterinary school at the Ohio State University, graduating in 2006. After veterinary school, she spent a year in Colorado doing an equine internship at Littleton Large Animal Clinic. 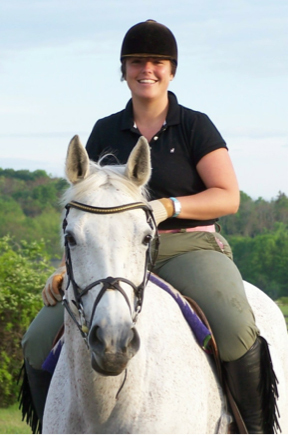 Dr. Sotela joined Rhinebeck Equine in 2007. Her special interests include sports medicine, imaging, lameness, and dentistry. Dr. Sotela is pursuing her certification in lameness diagnosis from The International Society of Equine Locomotor Pathology (ISELP). These advanced imaging and lameness courses focus on anatomical regions of the equine athlete with intensive ultrasound training. Completion of eight modules qualifies candidates to undergo competency examination for Society certification. In her spare time, Dr. Sotela enjoys many outdoor activities including skiing, hiking, kayaking, biking and live music. She lives in Red Hook and has a gray cat named Shadow. She speaks fluent Spanish, and is enjoying all that the Hudson Valley has to offer!